It's here! 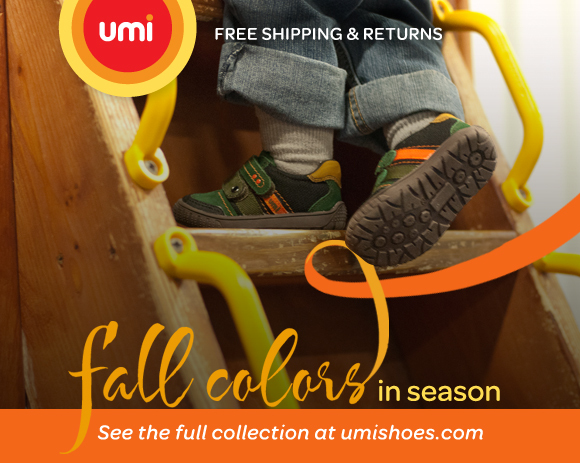 We are giving away the fabulous, must-have Tea Collection $100 Gift Card and Umi $60 Gift Card to help you with your child's back to school (or preschool, or homeschool) wardrobe! The third prize is from Fundanoodle, creators of fun and engaging early learning/handwriting systems for toddlers, kindergartners, preschoolers, and first graders. 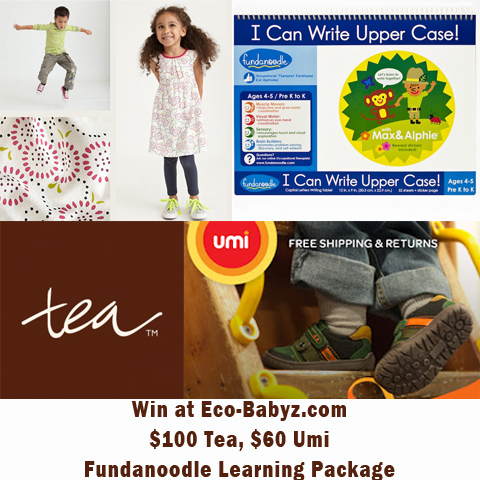 To enter our giveaway at Eco-Babyz for the $100 Tea Collection Gift Card, $60 Umi Gift Card, and Fundanoodle Learning Package all you have to do is complete the mandatory entry in the Rafflecopter form below. All other entries are optional and increase your chances of winning. There will be three winners! One winner per prize - so your odds are pretty good and winning something! At Tea, my favorite is the City Biker Tee. At Umi, my favorite is the Brogan shoes. At Fundanoodle, my favorite is the I Can Do Fun Activities Floor Pad. Love the Raya Stripe rompers at Tea Collection, the Bodi boots at Umi and the learning systems at Fundanoodle, starting at age 3! I really like the roll up cargo shirts at TEA Collection, the Bodi shoes at Umi, and "I can do fun activities floor mat from Fundanoodle. Fundanoodle I can do fun activities floor pad. Lotus Wrap One-Piece, Cassia, Fundanoodle I Can Write Lower Case! I love the Pendant Umi shoes, the Marguerite Banded Dress at Tea Collection, and the FUndanoodle I Can Do Math workbooks. 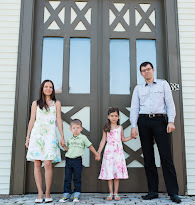 I like the Magnolia Batik Dress in purple at the Tea Site, the Terran Shoes for boys at Umi and the Fundanoodle I Can Build Upper Case Letters! Activity Kit. Tea collection - Two Tie Romper, Umi Shoes - Shane, Fundanoodle - I Can Write My Own Stories! Thanks for the chance to win TEA. Love those folks! I like the Umi Gift Card. Tea and Umi, i like their shoes. I like everything in the 3 year old system section at Fundanoodle. I like the Brogans at Umi for little boys. I like the Fire Engine Red 5 piece set at Tea for boys. From Tea Collection: Butterfly Dot Dress :) From Umi: LOVE the Bluet shoes in every single color for my baby girl :) and from Fundanoodle the Fundanoodle I Can Write Upper Case! sounds great for my pre-k 3 yr old. At Tea Collection I love the Tossed Butterfly collection PJs. From Uni I love the Braden shoes in Brown Multi. From Tea Collection I like the Kukka Butterfly Playdress. From Umi I like the Ravern shoes. From Fundanoodle I like the Fundanoodle I Can Build Upper Case Letters! Activity Kit. and Fundanoodle the I can Cut! I like the Waves Batik dress, the Bodi shoe, and the I Can Do Math Level 1 book! i like the Hockey Bot 5-Piece Set, the calie in pewter, and the Fundanoodle I Can Write Numbers! The Tea collection solid wrap one-pieces! From the Tea Collection I like the Dinosaur Tee. From Umi I like the blue Rory shoes. From Fundanoodle I like the I Can Do Fun Activities Floor Pad. I love the Spiral flora 5 piece set from Tea collection, the Morain shoes in lavender by Umi and the bead, lace, rip and trace multi activity set from fundanoodle! From Fundanoodle : Fundanoodle I Can Write My Own Stories! I love the tea collection. I could drink it everyday!